Independent self-drive touring in delightful small hotels. Let Spain & Portugal, in all their magnificent glory, be the backdrop of the holiday of a lifetime! Small but endlessly captivating, Portugal, full of delightful contrasts, is the ideal destination for an wonderful touring holiday. Let our experts take the stress out of your holiday planning. We pride ourselves on our personal service and would love to talk to you! Take an independent, self-drive, touring holiday in Spain or Portugal and discover a land of contrasts. Stunning beaches and breathtaking mountain scenery, monumental cities and untouched villages, haute-cuisine and superb local fare, all criss-crossed by ancient pilgrim ways and trading routes. 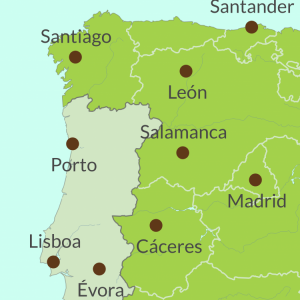 With low-cost flights to all key points and ferries to Bilbao and Santander it’s never been easier to take a Portuguese or Spanish (or cross-border) touring holiday. The Iberian Peninsula, in all its magnificent glory, is the backdrop for the holiday of a lifetime! It was a perfect mix of coast and mountains and the scenery was amazing. Los Picos de Europa has scenery to rival the Rockies! We travelled with Casas Cantabricas last year and were so impressed we returned to them .. .Already wondering what we can ask them to organise on future occasions. Interesting, exciting, memorable and well planned with some unusual and delightful hotels we would never have discovered on our own. We had a brilliant week in northern Spain,discovering an area previously unknown to us and a world away from the Costas and heavily developed islands. What a revelation. Lush, verdant, mountainous and ‘alp’ like. Simply stunning and a warm, welcoming populace too. Excellent roads and so lightly used. We spent 10 days touring Northern Spain and Portugal – from Bilbao in Spain to Rotondo outside Evora in Portugal – on a motorbike and had a fantastic holiday! We loved it! For more details about our independent tours in Spain and Portugal see the All our tours page or take a look at our frequently asked questions on the About the tours section. The suggested hotels are shown in the full details section of each tour but to get an idea of what we mean by charming small, independent hotels see our About the hotels page. 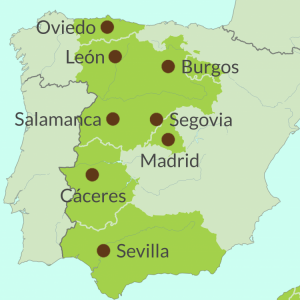 We offer mostly the lesser-known areas of Spain and Portugal and our tours are designed to give a good insight into a region or aspect of the countries whilst staying in style and travelling at a leisurely pace. 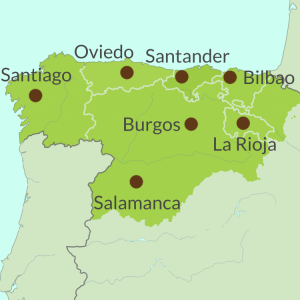 Some follow great pilgrim ways like that of St James, the Camino de Santiago (Camino del Norte , Camino del Portugues or Camino del Frances), or ancient trading routes like the Via de Plata, whilst others offer an in-depth insight into the various facets of a particular region such as Galicia, Castilla y León, Andalucia or Centro de Portugal. Wherever you go you’ll find an immensely rich heritage, wonderful food and wine, amazing scenery and a warm welcome. 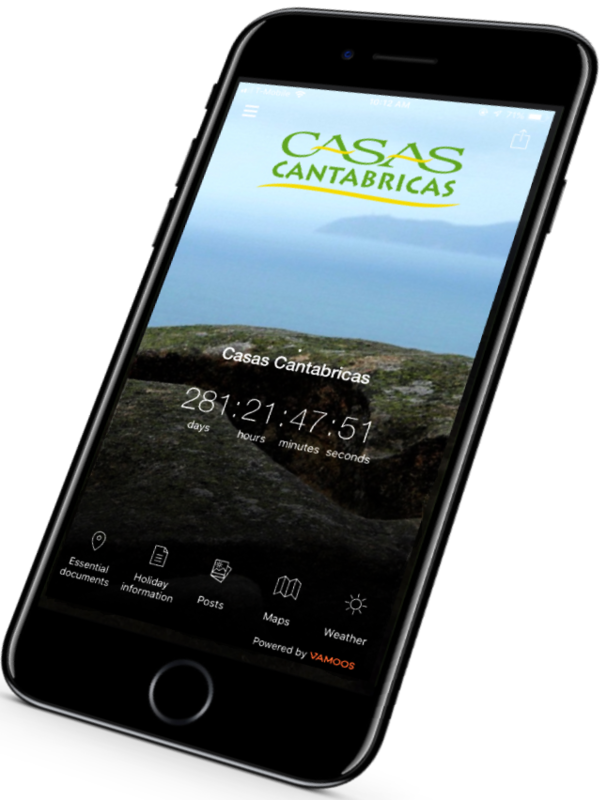 As a Caminos client you will receive your own personal Vamoos travel app and e-document manager for mobile devices. 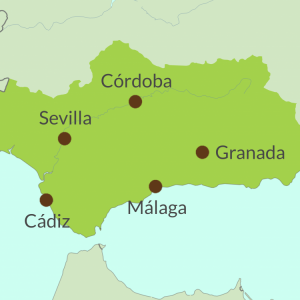 Our team of experts have over 30 years travel expertise in Spain & Portugal. You’ll receive friendly, personal service from start to finish of the booking process. Whilst on holiday you can call our local agents any time via our helpline. We’ll tailor your trip to best suit your individual requirements and budget. 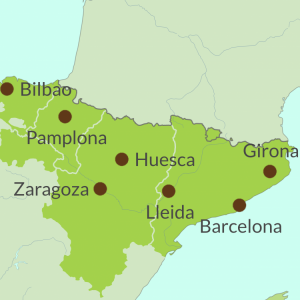 We also offer a range of villas and cottages in the north-west of Spain. Find out more about Casas Cantabricas. Read independent reviews from our clients. 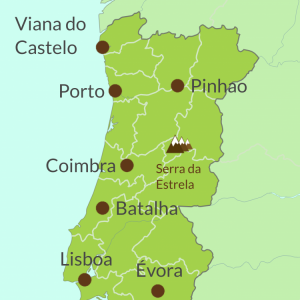 You’ll travel independently and discover a different Spain and Portugal, away from the tourist traps. You’ll stay in charming, independent accommodation. From castles, palaces & Paradors to rural guest-houses we’ll only recommend accommodation we know and trust. Your touring information pack includes full directions, a guidebook and touring map. We’ll also provide your personal Vamoos travel app – with all your essential docs as well as our own travel guides to each area. For more info see FAQs about the tours. We are a fully bonded UK tour operator established in 1986 and your money and your holiday are fully protected when you book with us. Casas Cantabricas is a member of AITO, the Association of Independent Tour Operators. Established in 1976, the AITO symbol has become the hallmark of good holidays from specialist tour operators. All AITO companies are fully bonded and governed by AITO’s independent dispute settlement service, which means you are in safe hands when you book with an AITO member.